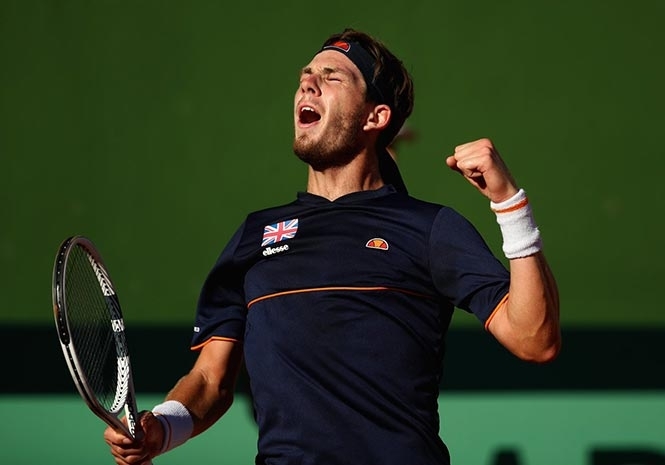 GREAT BRITAIN pulled level with Spain at the Davis Cup 1st Round in sensational style as Cameron Norrie staged a dramatic comeback to beat Roberto Bautista Agut in five sets. The world number 114, who was playing his first professional match on red clay, came from two sets down to beat the Spaniard in a 4-6 3-6 6-3 6-2 6-2 victory to level the Davis Cup World Opening round tie 1-1. Speaking after the victory, the Brit told the media: “I was nervous and had a streak in the second set where I couldn’t get a serve but I pulled it together. It all seemed to be going world number 23 Bautista Agut’s way in the second match of the day as he battled to an early two set lead. And it seemed to be going the same way in the third as the Spaniard raced into a 3-0 lead at the beginning of the set. But Norrie, ranked 91 places lower than his opponent, fought back hard and produced some outrageous shots on his way to winning six games in a row and securing the third set. And Norrie kept fighting in the 4th set, as he won 67 per cent of his first served and managed an astonishing 16 forehand winners as he levelled the match. Following the impressive victory, British Number One Andy Murray, absent through injury, tweeted his congratulations to Norrie. The Scot said: “That’s one of the most amazing wins/results/upsets I’ve seen in a long time on a tennis court. That’s one of the most amazing wins/results/upsets I’ve seen in a long time on a tennis court.. Well done to cam norrie and all the team.. Broady was excellent too ?????? Speaking on the court, he said: “At two sets down you’re thinking just keep fighting, keep pride and passion. It’s amazing to see Cam, as a rookie, a debutant, actually wear the opponent down. We’ve had a lot of good moments in Davis Cup and this is one of them right now. Earlier in the day, Spain had taken the lead in the tie after Albert Ramos-Vinolas beat Liam Broady in straight sets, 6-3 6-4 7-6 (8-6). The Brit performed well against Ramos-Vinolas, but was ultimately outplayed by the world number 21 on the red clay in Marbella. The tie continues at Marbella’s Puente Romano Tennis Club tomorrow (Saturday) morning as Jamie Murray and Diominic Inglot face off against Feliciano Lopez and Pablo Carreno Busta in Saturday’s double runner. Previous articleThe original wrist watch – updated!